All but one of the parks at the beach is for residents only. Morgan Park with very limited parking is the only public access. Click the above link to go to a chart showing beach access locations in the City of Clearwater. 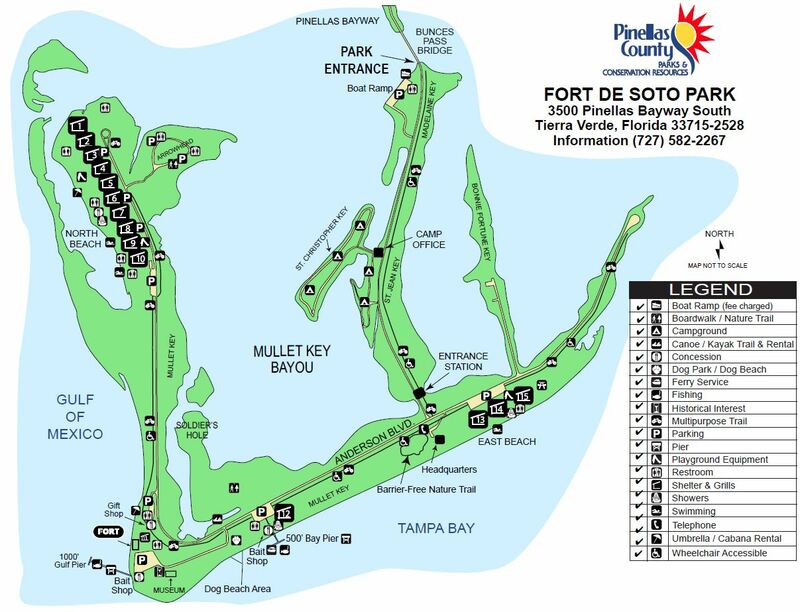 Click here to go to map of Fort De Soto Park. Surf fishing at Fort de Soto Park in Florida. Fort Howard Park is 155 acres in size. The causeway offers many shoreline fishing spots, the main areas of the park offer; picnic pavilions, playground, hand launch area, swimming, rinsing showers, restrooms ( check status ), and quite a bit of roadside parking. The beach is at the end of the causeway and has a large parking area also. Scenic vistas, butterfly garden and walking paths under large oaks are some of the other activities at the park. Please check before going about restroom closures at this park. 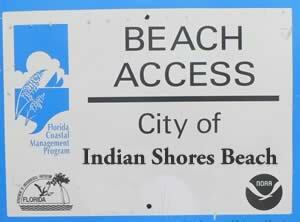 Click the above link to go to a chart showing beach access locations in the City of Indian Rocks Beach. Click the above link to go to a chart showing beach access locations in the City of Indian Shores. Click the above link to go to a chart showing beach access locations in the City of Madeira Beach. Large parking lot 150+/- with pay kiosks, rinsing showers and restrooms. Not a traditional beach setting, but there are areas where you can sit and sunbath near the water. Some shaded areas near water if sun is not your thing. Parking fees do apply. Operated by the City of Oldsmar. Beach access, pavilion, rinsing showers, benches, 22 metered parking spots and restrooms. City of North Redington Beach. 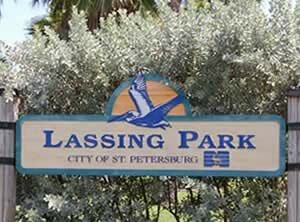 North Shore Park sits on 33.2 acres along the western shores of Tampa Bay and the amenities include; Beach area ( on the bay ), sunbathing, playground and restrooms. North Shore Park is just north of Vinoy Park. 235+/- metered parking spaces, 9.4 acres, beach access, swimming, sunbathing, rinsing showers and restrooms. Click the above link to go to a chart showing beach access locations in the City of Redington Beach. Click the above link to go to a chart showing beach access locations in the City of Redington Shores. Redington Shores Beach sits on 3.5 acres and amenities include; Beach, 170 parking spaces ( fee ), showers and restrooms. 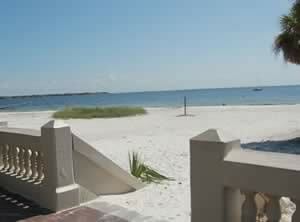 St Pete Municiple beach is 6 acres in size and offers 500 feet of beach, swimming and sunbathing. Picnic pavilions, a snack bar and restrooms are also available. Check status of lifeguards prior to visit. Click the above link to go to a chart showing beach access locations in the City of St. Pete Beach. Click the above link to go to a chart showing beach access locations in the City of Treasure Island. Beach, showers, restrooms and metered parking. Upham Beach sits on 9.4 acres and offers beach access, swimming, sunbathing, rinsing showers, and restrooms. Areas of Salt & Brackish Water in Pinellas County Florida Includes; Alligator Lake, Anclote River, Big Bayou, Boca Ciega Bay, Boggy Bayou, Charlotte Harbor, Clearwater Harbor, Cross Bayou, Grande Bayou, Gulf of Mexico, Kreamer Bayou, Lake Tarpon Canal, Little Bayou, Long Bayou, Minetta Bayou, Myers Cove, Old Tampa Bay, Pelican Cove, Riviera Bay, Scharrer Bayou, Snell Isle Harbor, Spring Bayou, Stevenson Creek, St Joes Creek, St Joseph Sound, Tampa Bay, Tarpon Bayou, The Narrows and Whitcomb Bayou.